Kateri Tekakwitha (1656 – April 17, 1680), the daughter of a Mohawk warrior and a Christian Algonquin woman, was born in the Mohawk fortress of Ossernenon near present-day Auriesville, New York. At the age of 4 smallpox swept through Ossernenon, and Tekakwitha was left with unsightly scars and poor eyesight. The outbreak took the lives of her brother and both her parents. She was then adopted by her uncle, who was the chief of the Turtle-clan. As the adopted daughter of the chief, she was courted by many of the warriors looking for her hand in marriage. However, during this time she began taking interest in Christianity, which was taught to her by her mother. In 1666, the Marquis Alexandre De Prouville de Tracy burned down Ossernenon. A new fort,Kahnawake, was built on the north side of the Mohawk River in what is now Fonda, New York. While living here, Tekakwitha was converted and baptized in 1676 by Father Jacques de Lamberville, a Jesuit. 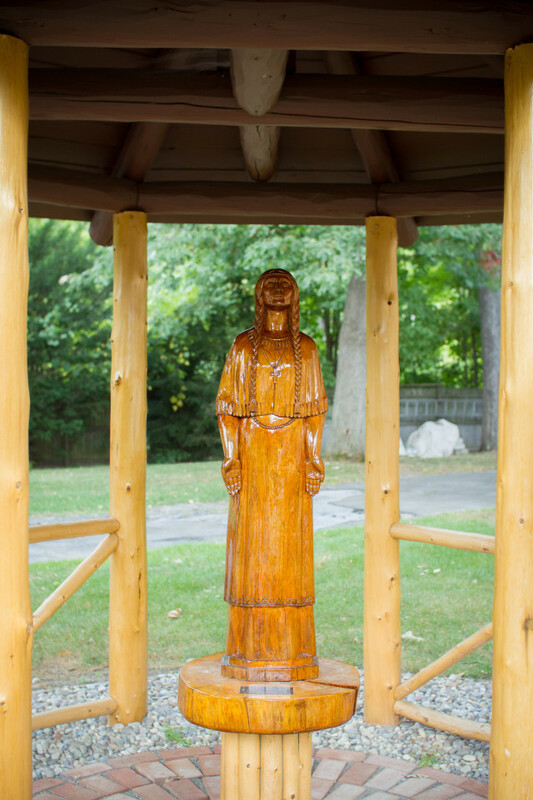 At her baptism, she took the name “Kateri”, a Mohawk pronunciation of “Catherine”. Unable to understand her zeal, members of the tribe often chastised her, which she took as a testament to her faith. moved to Kahnawake, Canada where she lived a life dedicated to prayer, penitential practices, and care for the sick and aged. In 1679, she took a vow of chastity. A year later, Kateri died at the age of 24.